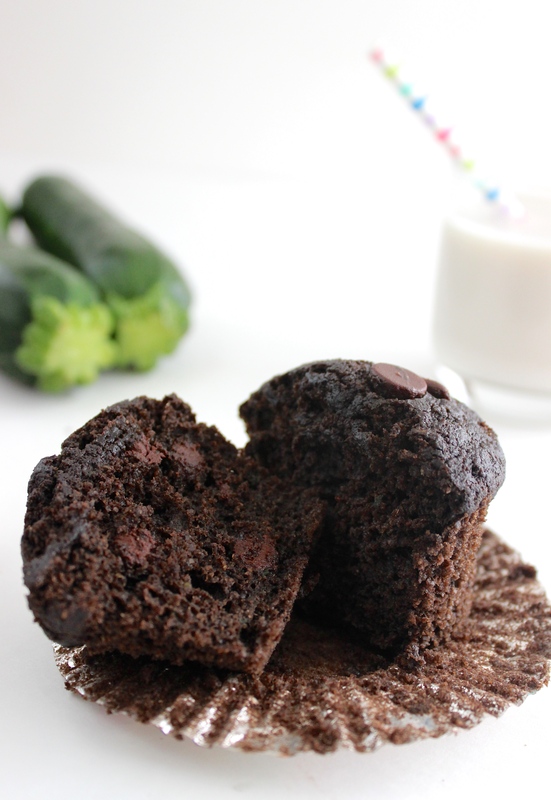 These double chocolate zucchini muffins are moist, packed with chocolate, and healthier than your average muffins at only 190 calories each! Let’s talk muffins! I’ve always loved them, but they’re usually loaded with sugar and oil, which means that I don’t eat them all that often. I just can’t justify eating something on a regular basis that’s really sugary, not super filling, and easily 300+ calories apiece, especially since it’s gone in 4 or 5 bites. That’s where healthier muffins come in. 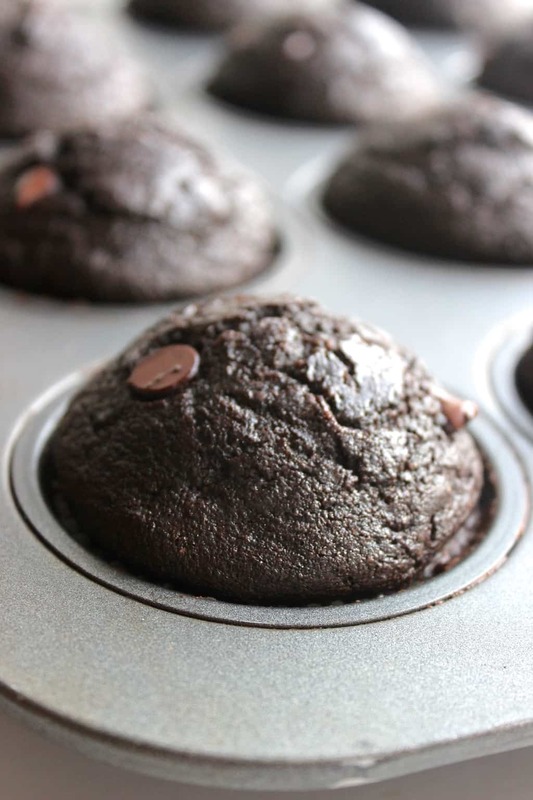 These healthy double chocolate muffins are packed with fresh zucchini, which helps make them moist (and it’s a great way to sneak some veggies in without tasting them!) If you’ve never had zucchini bread, you may be thinking that adding shredded vegetables to your muffins sounds strange…but it’s a lot like making a carrot cake which doesn’t taste like carrots at all. 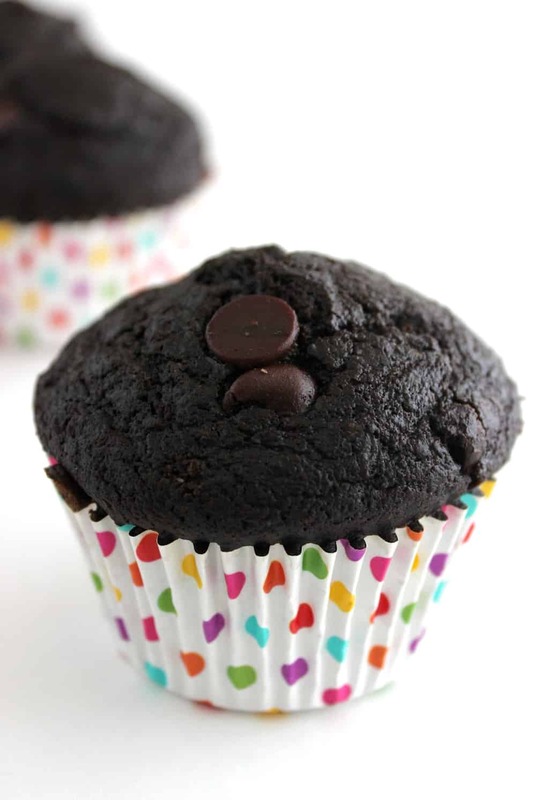 The strands of shredded zucchini disappear into the muffins during their time in the oven, leaving you with a perfectly moist chocolate muffin with no traces of green. I used my two favorite chocolate weapons: dark chocolate cocoa powder and espresso powder. 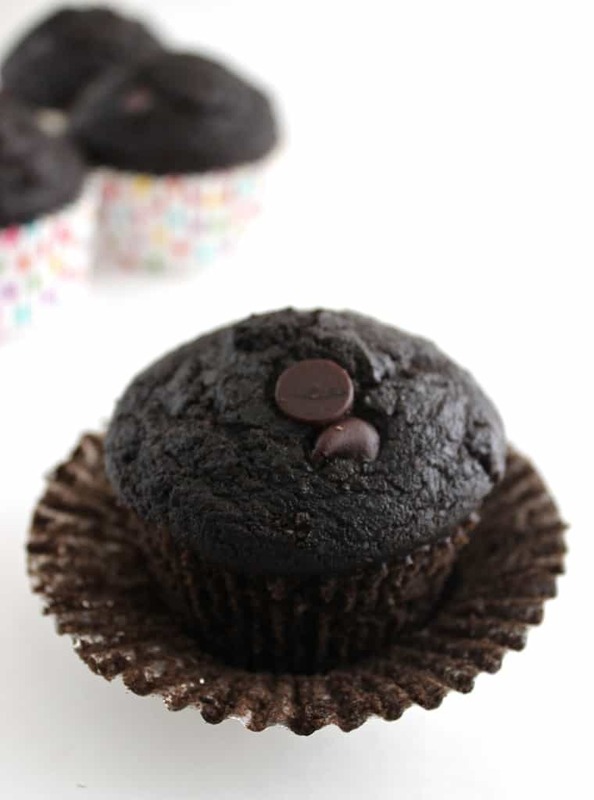 You can certainly use regular cocoa powder and omit the espresso powder, but both help give the muffins a deeper, richer chocolate flavor, and that’s never a bad thing in my world. I use both in these fudgy dark chocolate brownies! If you’re lucky enough to have a summer garden overflowing with zucchini or if you have access to some fresh zucchini at your local grocery store or farmer’s market…you know what the right thing is to do. Preheat oven to 425 degrees. Lightly grease a 12-cup muffin tin or fill it with cupcake liners. Set aside. In a medium bowl, whisk together flour, brown sugar, cocoa powder, espresso powder, baking powder, and salt. Gently stir in eggs, milk, oil, and vanilla until almost combined. 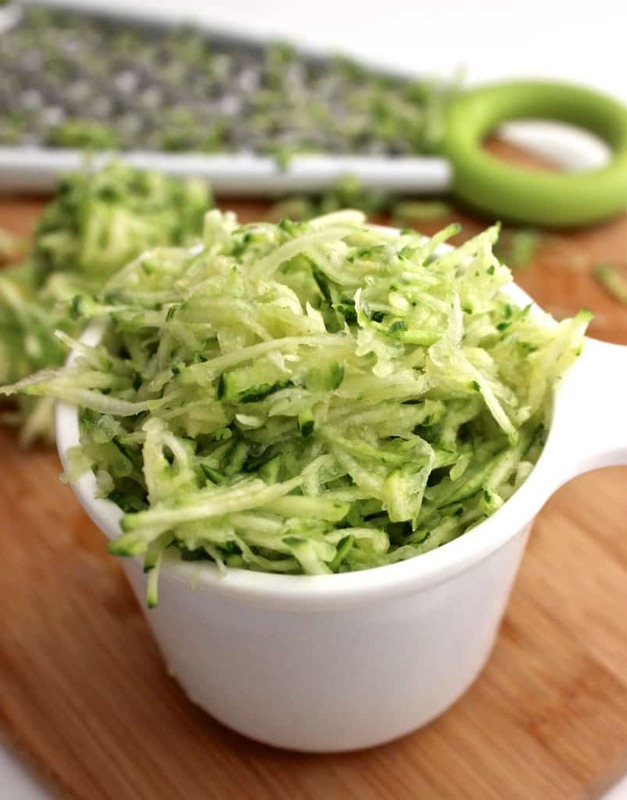 Wash zucchini and finely grate it using a cheese grater or food processor. Using paper towels, wring most of the excess liquid from the shredded zucchini. 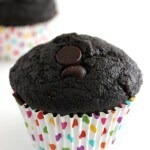 Gently fold the zucchini and chocolate chips into the muffin batter. Divide batter between the 12 muffin cups. Sprinkle a few extra chocolate chips on top, if desired. Bake muffins at 425 degrees for 5 minutes, and then reduce the heat to 375 degrees and continue baking an additional 13-15 minutes, or until a toothpick inserted into the middle of a muffin is mostly clean with a few moist crumbs. Cool muffins in pan for 5 minutes before transferring to a wire cooling rack. I love zucchini bread/cupcakes/muffins! I’d love to give these a shot soon. Hmm I think my favorite type of muffin is blueberry or lemon poppyseed, but there are a lot good ones. And I’m definitely a dark chocolate person! I agree- I’m for dark chocolate 100%! Well, not 100% dark chocolate, but you know what I mean 🙂 70% to 80% dark chocolate is perfect for me! Holy moly do these look good! They look so dark chocolately and delicious. I think espresso powder makes a huge difference when baking with chocolate. It definitely brings out the chocolate flavor. I agree! The first time I made a recipe that called for espresso powder, I debated whether or not I should buy it because I wasn’t sure how often I’d actually use it…but it turned out to be a $3 or so well spent! Your paleo zucchini brownies look incredible! I love the color of these muffins! So dark; just the way I like it. I have never had zucchini in anything, dessert or oatmeal, but I could get behind this recipe. 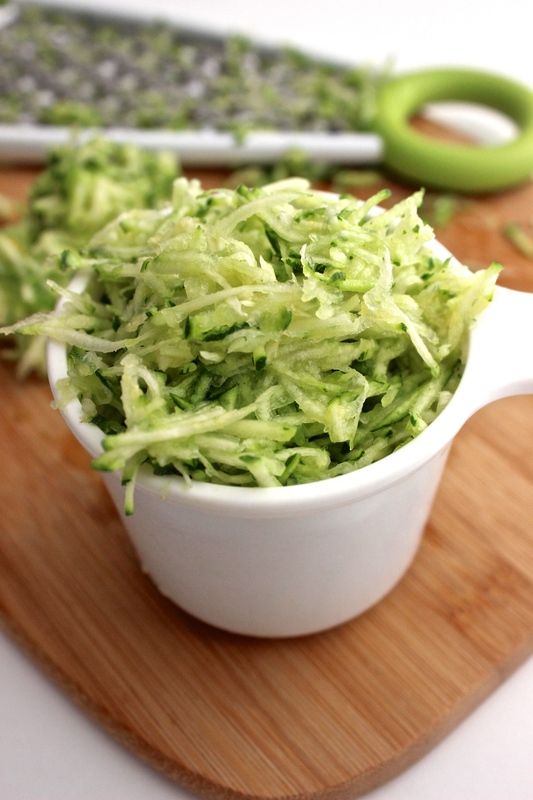 Question for you: If I were to try this out, how do I shred the zucchini? Sorry, that might be a dumb question, but I don’t work with vegetables all that often. Not a dumb question at all, Julia! You can shred the zucchini with a cheese grater or in a food processor 🙂 I’ll adjust the recipe to clarify that. I’ve been looking to try a salad in a dessert sort of a recipe. These cupcakes look so moist and delicious. Love that close up shot! OOOO my! This is every girl’s dream… Well, I am stereotyping to believe that every girl loves chocolate, lol! I actually don’t – but these still look pretty perfect! I love adding veggies to my desserts! My kids are always trying to guess what I’m hiding in their food!! Yum yum yum!! Will give it a shot soon ?? I stumbled upon your recipe today trying to use my bounty of zucchini from my garden..and OMG…it is fabulous !! Definitely a keeper. I shared some with my neighbor, and she called me and said “I must have that recipe” LOL, I printed it out for her. Thank you for sharing your recipe. YAY, I’m so glad to hear you loved this recipe, Ro! Thanks for reporting back!